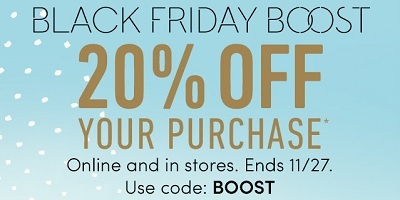 Black Friday Boost: take an extra 20% off your purchase! To receive the offer use the promotion code BOOST at checkout. Plus, get a free shipping which is valid on online orders of $50 or more shipped to a single U.S. address. Source of the information is Athleta. The offer is valid at U.S. Athleta stores and Athleta online. The offer is valid until November 27, 2016.